It’s a stop on main day trips by tour buses around the island and you will see many people spilling into the temple and leaving just as quickly. Browse places to stay in Tanah Lot on Booking.com. Book Now - Pay Only When You Stay. It doesn’t really do this place justice as the most impressive thing about it is the shaded jungle feel down the back of the property where you can sit and contemplate for a little while. Better still is a rest on the shores of the moat which surrounds the temple and which can be accessed from outside of the temple gates — it’s serene, rarely visited by the hordes and provides a peaceful escape if you wander far enough away from the main road. 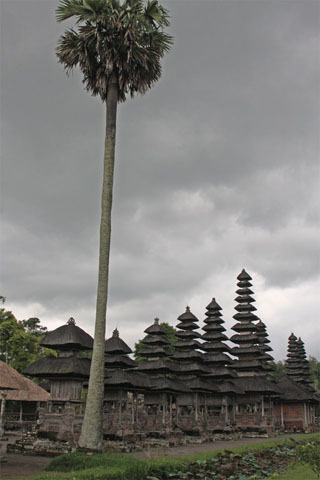 The temple itself is pretty enough and is a little different from many of the other temples in Bali due to the different numbers of tiers on the meru — these range from 2 to 11. Certainly worth a stop on your way past. Bemos pass by Mengwi heading north from Denpasar. Catch one of these and ask it to drop you off in Mengwi, walking the 300m east following the signs towards Ubud. See below for more sights and activities in Tanah Lot that are listed on Travelfish.org.